England’s embrace of the Super Bowl probably has more to do with sliders and fried chicken than it does with the actual sport. Everyone knows that American football is just rugby for wimps. Fortunately, this makes nobody resistant to the charms of cheerleaders and all-around, old-fashioned, American good times kitsch. If you’re planning on staying up till the early hours on Sunday to catch the game, here are the best places in London to do it. 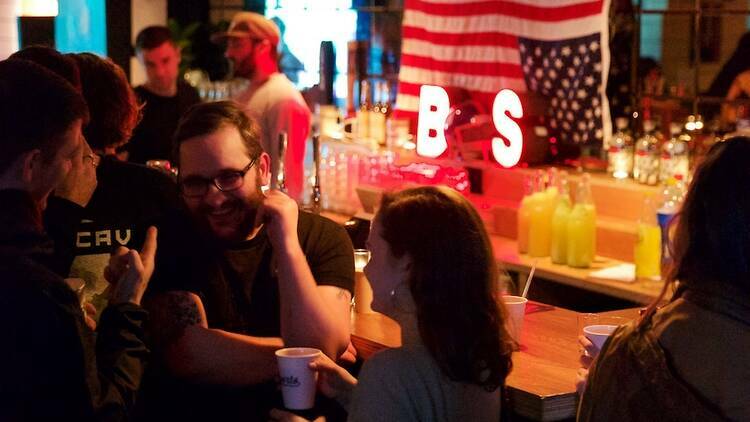 The closing of Bad Sports on Hackney Road – a taqueria and dive bar that was always full to bursting – sounded like a death knell of independents, so we’re thrilled to see them rise from the dead to throw this one-off crazy Super Bowl bash. Their famous Buckfast negronis will be on offer alongside traditional American fare at Mare Street Market, and we don’t think you’ll want to miss it. Long Arm is always packed to the rafters, so make sure you buy tickets ahead to their legendary Super Bowl bash. With a healthy seven large screens blasting the game throughout the venue, if Long Arm’s own ‘Tank Fresh’ beers don’t tempt you, the cheerleaders might. If you want to watch the Super Bowl in style, then Marcus Samuelsson’s Red Rooster at the Curtain Hotel is the place to do it. Already famous for it’s fried chicken and other American style treats, there will also be bourbon soft serve to keep you going till the wee hours in Shoreditch.